Yesterday I did what any architect in the city would do. Worked with a structural engineer on some jobsite issues a contractor was having. Checked in on some clients about when some new work is going to be green lit. Finished up a long and technical reply to a building's engineer's comments about my proposed alteration. And, gave blood in an art gallery I designed. The piece was part of Kate Levant's piece Blood Drive. I was the first one in as the team from New York Blood Center were setting up. They didn't really know they were in an art gallery, and didn't know they were part of an artwork. They didn't care; they'd done drives in art galleries before, and because they are in different spaces every single day, they never really got connected to their surroundings. They are blood nomads, I guess, with their tackle boxes and their reclining chairs not unlike the plastic-strappy lawn chairs I reclined on in my back yard in Ohio in the late 1970s. Already I could see what was happening. Blood is transient. It expires. People have to run around to collect it. The furnishings that comprise its collection look like junk, like the installations that were hanging on Zach Feuer's walls. There is something refreshing about having a contemporary art gallery taken over by such utilitarian concerns. Manhattanites get a little too precious with our space and it's refreshing to see folks a little more rough and tumble come in and ignore the precious, precious whiteness of the walls. And that the folks who had sauntered in to think about donating blood were scared and worried about it, because it will interfere with their yoga breathing or macrobiotic diet or whatnot. People, gotta love 'em. And, why don't we use spaces like this all the time? Seriously, growing up in Ohio there were blood drives everywhere. Galleries are closed or slow in August, particularly this week. What a perfect place to set up a volunteer, life-saving organization. 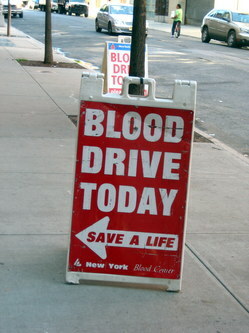 The blood drive was completely devoid of political statement about the fact that gays still have to lie to give blood. I'm thankful for that; the folks working the blood drive don't care, and it's something that needs to be handled by the FDA anyway. But I am still conflicted for consciously lying on a form for the first time, ever. I am hoping this admission here, THAT I LIED ABOUT NOT BEING GAY SO I COULD DONATE BLOOD YALLS, will make up for that.